Click on the Price Match Promise link below or call us on 0344 800 4444 and we will happily price match. 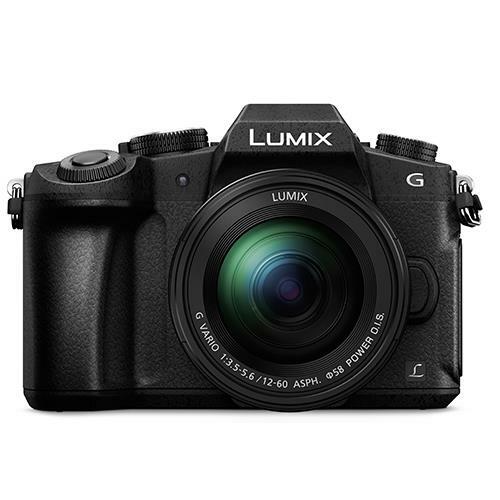 The Panasonic LUMIX DMC-G80 is the successor to the Panasonic G7 and includes the same 16 megapixel Digital Live MOS Sensor as the G7 but with no AA filter. 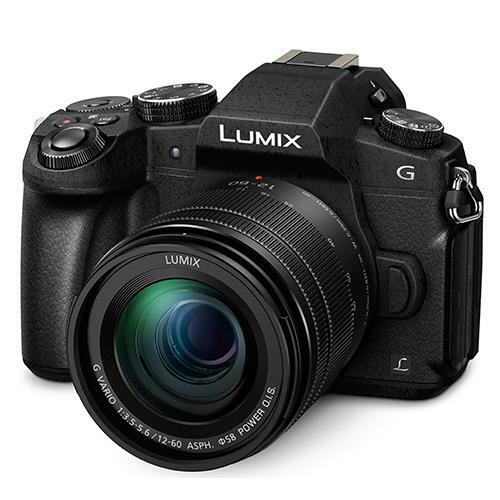 The Lumix G8 also upgrades with a new Venus Engine, 2.36M dot OLED Electronic Viewfinder with increased magnification and longer eyepoint, in-body 5-axis Dual image stabilization and new in-camera focus-stacking mode. The rugged magnesium body construction is splashproof and dustproof, so it's ideal for outdoor everyday use. Easy Wireless Connectivity via Wi-Fi lets you connect with your smartphone. .The new LUMIX DMC-G80 features an updated Image Stabilization system – the 5-axis Dual I.S. MK II By incorporating new gyro-sensor technology, the O.I.S. (Optical Image Stabilizer, 2-axis) and B.I.S. (Body Image Stabilizer, 5-axis) are able to work in perfect harmony and with outstanding accuracy. With improved suppression of blur, resulting pictures and videos remain beautifully crisp despite vibrations caused by shaking hands or traversing outdoor terrain. With the LUMIX DMC-G80’s ability to analyse shooting conditions, including focal length, the new Dual I.S. system is able to utilise max. 5-stop slower shutter speed . Users can also enjoy blur-free photo/video shooting in both wide angle and telephoto, even in low light situations or when shooting with one hand. 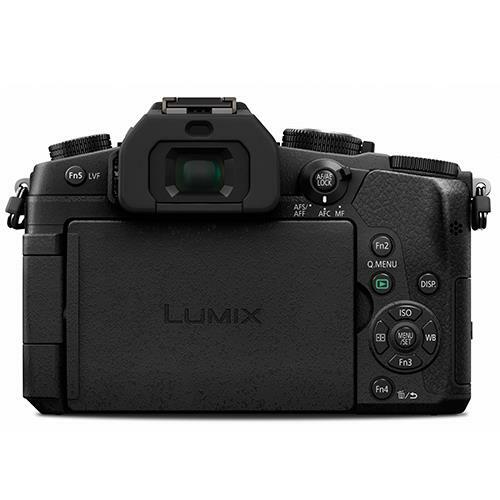 To further minimise unwanted vibration, the LUMIX DMC-G80 also utilises an electromagnetic drive in the shutter unit. The shock caused by the movement of shutter diaphragm is dramatically reduced and shutter sound is also minimised. Together with the adoption of solid magnesium for the front panel, shutter vibration is reduced by approx. 90% compared with the DMC-G80’s predecessor, the G7. 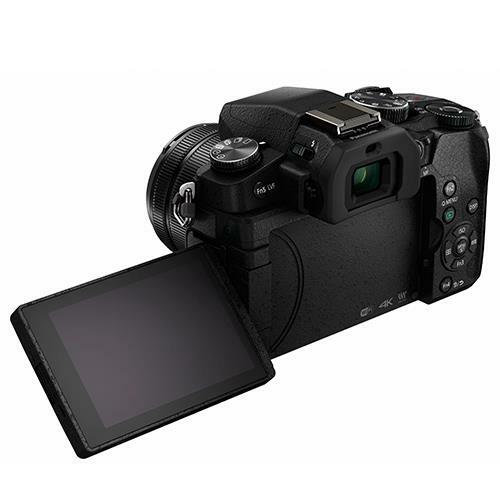 The 16.0-megapixel Digital Live MOS Sensor and new Venus Engine combine to allow users to shoot vibrant, true-to-life high quality images with excellent resolution, high contrast, impressive colour reproduction and max. ISO 25600 high sensitivity. By removing the Low Pass Filter from the DMC-G80’s sensor, the limiting resolution is improved by approx. 10%. At the same time, the Venus Engine reproduces vibrant, impressive colour – such as clear sky – by dividing hue, saturation and luminosity and finely adjusting them individually. Taking advantage of this fine tuning capability, the LUMIX G80 enables users to choose a pre-set of contrast, sharpness, saturation and noise reduction that suits their environment and shooting style. Panasonic’s LUMIX G cameras are not only renowned for their still image quality, but also for their high quality video capability in 4K. 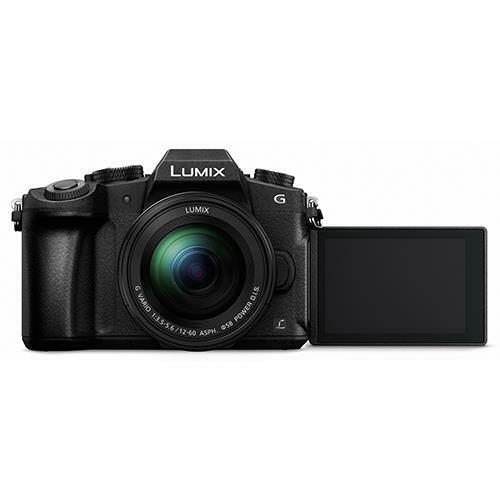 The LUMIX DMC-G80 records stunningly smooth, high-resolution QFHD 4K video in 3840x2160 at 25p (50Hz) or 24p in MP4 in addition to full-HD 1,920 x 1,080 at 50p (50 Hz) videos in AVCHD Progressive or MP4 (MPEG-4 / H.264) format with practical full-time AF. Utilising the LUMIX DMC-G80’s exceptional 4K video recording capability, the 4K Photo function allows users to extract an 8-megapixel still with exact precision, enabling even the most fleeting moment to be caught in a still image. 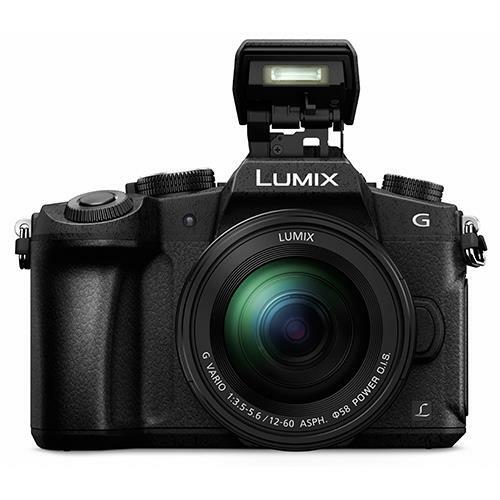 Three exclusive 4K Photo functions are integrated into the LUMIX DMC-G80: 4K Burst Shooting, 4K Burst (Start/Stop) and 4K Pre-burst; all of which help allow photographers to capture and record that perfect picture by cropping the exact frame they want out from the recorded 4K video footage. In addition to 4K Photo, the DMC-G80’s contrast AF achieves even faster and more precise focusing with digital signal communication at max. 240 fps. The Contrast AF system in the LUMIX DMC-G80 is further enhanced by Panasonic’s integration of Depth From Defocus (DFD) technology which shortens the focusing time even further. Even if focus is not exactly as the user intended when the shutter is pressed, the LUMIX DMC-G80 also comes with the Post Focus function that enables users to select the specific focal point even after shooting – particularly helpful in situations like macro shooting where severe focusing is required. The camera now supports a Focus Stacking function. As taking a single macro photo with specific areas in focus can sometimes be difficult, Focus Stacking enables users to take multiple images of the same frame with different aperture values, then combine them into one image and select the area to be in focus. In addition, Low Light AF makes it possible to set focus on the subject more precisely in extremely low-lit situations (-4EV) such as wildlife photography at dawn or dusk, while Starlight AF, allows budding astronomers to capture individual stars and constellations in the night sky. To withstand the demands of heavy field use, the DMC-G80 adopts rugged design with a full die-cast magnesium front frame. It also features splash and dustproof construction thanks to the careful sealing on every joint, dial and button. To further enhance control, the LUMIX DMC-G80 comes with ergonomically-designed thick grip for a stable holding even in one hand. The front/rear dual dial system enables direct setting. For example, users can adjust white balance with a front dial and set ISO with a rear dial while choosing the shutter speed or monitoring the noise effect on the rear screen – ideal when dealing with complex lighting situations. The DMC-G80 boasts a large 2,360K-dot OLED (Organic Light-Emitting Diode) LVF (Live View Finder) with a magnification ratio of approx. 1.48x / 0.74x (35mm camera equiv.) and 100% field of view. It delivers high speed response with minimum time lag of less than 0.01 sec as well as 10,000:1 high contrast for exceptional visibility, plus, the eye point of approximately 20 mm offers high visibility and comfort even for users wearing glasses. The LVF also comes with a new Power Save Mode. If the sensor detects that the eye has moved away from the LVF, the camera automatically enters sleep mode after 3, 5 or 10 seconds. When the shutter button is half pressed, it instantly switches back into shooting mode. This feature helps to increase the amount of shots that can be taken with one battery charge by almost three times, from 320 to 800-900. Adopting a static-type touch control system, the 3-inch (7,62cm), 1040K-dot, free-angle rear screen is easy and intuitively to control. It also tilts vertically by 270-degree, which makes shooting overhead or at low angles even easier. Instant decision - instant dispatch. Buying the items you want just got easier, simply spend over £299 and you can spread the cost using our instant Finance facilities with Interest Free and Interest Bearing options available. You can calculate an example of your payments below depending on your preferred deposit amount. This is an example and you will be asked later in the checkout process to confirm your deposit again. Applying for online finance couldn't be easier or more convenient. Once you've chosen the products you'd like to purchase, simply complete a brief on-line application form accessed via the 'checkout'. Just follow the simple instructions, entering your personal details as required and we'll do the rest. Within minutes of your application being approved, you'll be asked to accept the terms of the contract – once you select YES you will return to the checkout and will proceed through to the completion of your order following which your order will be dispatched for home delivery. Following completion, you will receive an email with a link to download a copy of your credit agreement for your records. Shipment of your goods will follow as soon as your agreement has been returned to our finance company (usually on the same day). For more information on our finance payment option please click here for terms and conditions. Below are the finance options that are available on this product. 12 Months Interest Free Finance CB (0% APR). SanDisk Extreme SDHC 32GB 90MB/s UHS-I Memory Card. At Jessops, we know how easy it is to accidentally drop or damage things and then have the inconvenience of finding the cash for a replacement. Jessops Care & Protect offers accidental damage protection and (after the manufacturer’s guarantee has ended) breakdown cover for your selected item, and it is provided by Domestic & General Insurance PLC. These insurance polices are designed to meet the demands and needs of those who wish to insure their item, for example, digital camera and/or camera accessories, against breakdown and accidental damage. By taking up this policy, you agree that this product meets your demands and needs. I have read the IPID and the Terms & Conditions, which include details of the complaints procedure and the privacy notice. In order to fulfil your plan your data will be transferred to Domestic & General Insurance PLC. To find out how your data will be used please refer to their privacy notice here. Our "Collect at Store" service lets you add items to your basket and then collect them from a Jessops store: in as little as 30 minutes. When ready to checkout opt for "Collect at Store".